A group of rice breeding experts announced the adoption of six new rice varieties under the ARICA (Advanced Rice in Africa) label to help boost yields. The announcement was made during the 2014 AfricaRice Science Week and Global Rice Science Partnership-Africa Science Forum held in February at the Africa Rice Center (AfricaRice) headquarters in Cotonou, Benin. The experts, who were convened by AfricaRice, say the varieties were selected and labelled ARICA because they are tolerant to cold, salinity and iron toxicity. With these varieties, small[holder] farmers can increase their production. According to the Kenya-based African Agricultural Technology Foundation, countries in Sub-Sahara Africa spend more than US$1.7 billion a year to import rice partly because of insufficient production. 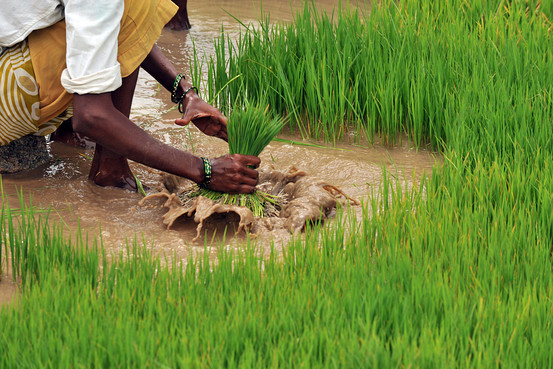 “With these varieties, small[holder]farmers can increase their production,” says Moussa Sié, a senior breeder at AfricaRice in Benin who coordinates the Rice Breeding Task Force in Africa, a group with a goal of creating new rice varieties for Africa. Sié adds that the new varieties could represent at least 40 per cent of the increase in rice productivity. The six new ARICA varieties were nominated among 41 varieties proposed by the task force. According to a statement from AfricaRice, the new varieties were selected through the project Stress-Tolerant Rice for Africa and South Asia (STRASA). The STRASA project develops stress-tolerant rice through both conventional plant breeding and molecular breeding techniques. AfricaRice and the International Rice Research Institute are implementing STRASA in partnership with national rice programmes in 18 African countries, including Burkina Faso, Gambia, Ghana, Guinea, Mali and Senegal, through funding from the Bill and Melinda Gates Foundation. Abdoulaye Sawadogo, a rice seed producer and president of Burkina Faso National Union of Seed Producers, notes that the ability of the new varieties to be tolerant to stresses could motivate farmers to adopt them. “These new varieties have come to give new hope to the producers of the world, particularly those in Africa suffering because of these different stresses," Sawadogo says, adding that the varieties could also help farmers adapt to climate change.